SANTA CLARA – Three positions along the 49ers’ offensive line are in flux heading into Sunday’s game against the Atlanta Falcons. Center Daniel Kilgore was placed on season-ending injured reserve Tuesday with a knee injury. Left tackle Joe Staley’s status is unknown after his streak of 100 consecutive starts came to an end over the weekend with a hamstring strain. Marcus Martin is likely to start at center against the Falcons. Andrew Tiller would get the call at left guard if veteran Zane Beadles is forced once again to move to left tackle to replace Staley. The 49ers could enter this week with rookies as the only two healthy backups, including a freshly converted defensive lineman. John Theus, a fifth-round draft pick, made his NFL debut on special teams Sunday against the New York Jets. 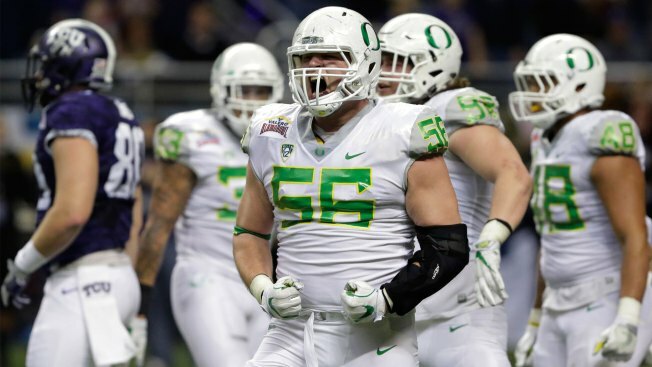 Former Oregon defensive lineman Alex Balducci signed with the 49ers as an undrafted rookie and was immediately converted to offensive line. He was signed to the practice squad as a center-guard after being waived during the cut to 53 players. Balducci was promoted to the active roster on Tuesday to take Kilgore's roster spot. After playing in just four exhibition games as an offensive lineman, Balducci has to be ready to go in a real game after a four-year college career playing on the other side of the ball. “You just got to fall back on your training,” Balducci said. “I’ve been doing this since OTAs now. I got to pick it up. got to go. If my name’s called, I got to be able to do it.